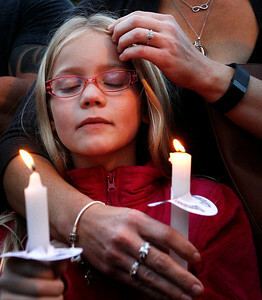 Matthew Apgar - mapgar@shawmedia.com Nicole Klem comforts her daughter Alexis Luke, 8, both of Huntley, as they hold candles during a vigil for domestic violence victims put on by Turning Point on Wednesday, Oct. 07, 2015 at Woodstock Square in Woodstock. 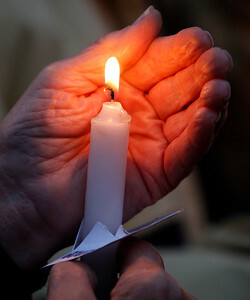 Matthew Apgar - mapgar@shawmedia.com Norma Karsten of Marengo holds a lit candle during a vigil for domestic violence victims put on by Turning Point on Wednesday, Oct. 07, 2015 at Woodstock Square in Woodstock. Matthew Apgar - mapgar@shawmedia.com (Back row from left:) Arnulfo Rojas, uncle, Carlos Rojas, father, Lorena Rojas, 13, (front row from left:) Michelle Rojas, 7, Lisset Rojas, 11, all sisters, and Yuliana Rojas, aunt, all of Woodstock, show their support for domestic violence victims during a candle light vigil put on by Turning Point on Wednesday, Oct. 07, 2015 at Woodstock Square in Woodstock. 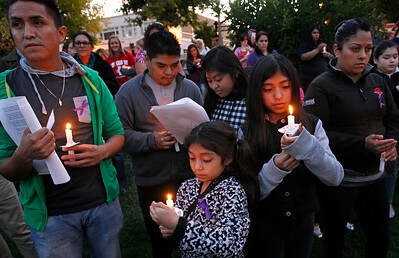 Matthew Apgar - mapgar@shawmedia.com Hundreds of supporters pack Woodstock Square with lit candles during a vigil for domestic violence victims put on by Turning Point on Wednesday, Oct. 07, 2015 in Woodstock. 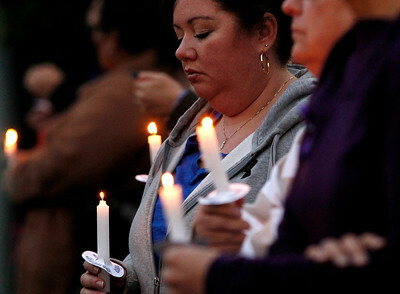 Matthew Apgar - mapgar@shawmedia.com Huntley Police Sergeant Linda Hooten fills a glass jar with colored sand, signifying overcoming a form of domestic abuse, during a vigil for domestic violence victims put on by Turning Point on Wednesday, Oct. 07, 2015 at Woodstock Square in Woodstock. 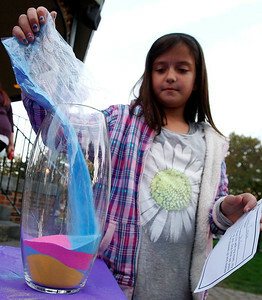 Matthew Apgar - mapgar@shawmedia.com Addison Ambrosia of Cary, 8, fills a glass vase with colored sand, signifying overcoming a form of abuse, during a vigil for domestic violence victims put on by Turning Point on Wednesday, Oct. 07, 2015 at Woodstock Square in Woodstock. 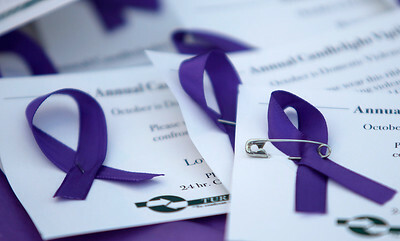 Matthew Apgar - mapgar@shawmedia.com Purple ribbons on a table await supporters during a vigil for domestic violence victims put on by Turning Point on Wednesday, Oct. 07, 2015 at Woodstock Square in Woodstock. 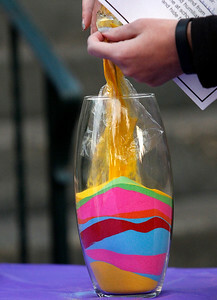 Matthew Apgar - mapgar@shawmedia.com Jessica Culbertson of Cary fills a glass vase with colored sand, signifying the abuse she's overcome, during a vigil for domestic violence victims put on by Turning Point on Wednesday, Oct. 07, 2015 at Woodstock Square in Woodstock. 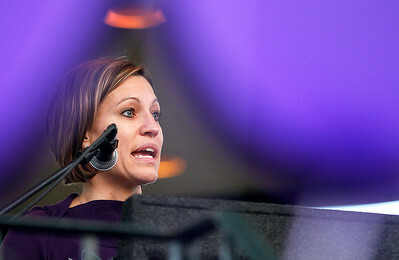 Matthew Apgar - mapgar@shawmedia.com Huntley Police Sergeant Linda Hooten speaks during a vigil for domestic violence victims put on by Turning Point on Wednesday, Oct. 07, 2015 at Woodstock Square in Woodstock. 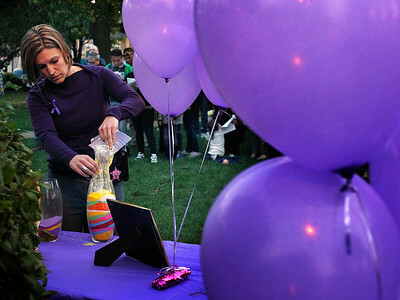 Huntley Police Sergeant Linda Hooten fills a glass jar with colored sand, signifying overcoming a form of domestic abuse, during a vigil for domestic violence victims put on by Turning Point on Wednesday, Oct. 07, 2015 at Woodstock Square in Woodstock.